Recurve bows have been around for several centuries and were primarily used for hunting and defense. At present, a recurve bow is still considered as a tool for hunting but is also used during archery tournaments and friendly competitions. In addition, a recurve bow is also commonly depicted in movies and TV shows, which has made it more famous. Hence, you may have already found many different designs and brands of recurve bows being sold everywhere. In fact, there are models for children, teenagers, or adults, as well as those that can be used by all ages. Some recurve bows are mainly designed for right-handed or left-handed people, while others have an ambidextrous design. Additionally, particular recurve bows are only suited for beginners or experienced archers, but there are also those that can be comfortably used by both. This wide-selection and different features make it difficult to choose the right recurve bow for you or your loved one. What makes it more challenging is that you can buy recurve bows in sports equipment shops, hunting tool stores, and online retail sellers. Definitely, when you choose to purchase online, you won't be able to hold and test it physically. While buying online does have its downsides, some of us still prefer to do so because it is convenient and transactions are sometimes faster. So, the best way to determine if you are buying a quality bow that matches your needs, wants, and lifestyle is to research and understand the different features. As this can be daunting, we can make it easier by giving you a detailed review of a recurve bow that you might want to consider purchasing. Huntingdoor is amongst the top brands that have a wide selection of bows and accessories used for small, mid-size, and large animal hunting activities. The Huntingdoor Laminated Takedown Recurve Bow is one of their products that can be assembled and disassembled. Unlike most recurve bows on the market, the Huntingdoor Laminated Takedown Recurve Bow has a riser that is made of maple laminate, giving it a stunning look without compromising its durability and performance. It has also been carefully finished with either red or a combination of black and red to give it a unique look. To help make the recurve bow sturdier, it’s been crafted with black fiberglass limbs. It also has phenolic reinforced tips to ensure that it shoots with precision and accuracy, leading to faster shooting speeds. The bow is lightweight and comes disassembled, which means that you can carry and store it easily in your bag while traveling to the hunting site or going back home. When not in use, you can also keep it in your garage or storage cabinet without it taking too much space. When you need to use it, that won't be much of a problem since you can assemble it quickly and effortlessly, especially if you are experienced. Although it does not come with an instruction manual, all recurve bows are assembled in the same way. So, if you have no experience, you can find tutorials online or even seek the help of an experienced archer. The Huntingdoor Laminated Takedown Recurve Bow has multiple drawback weights which are 30, 35, 40, 45, 50, and 55 pounds, so you can change it to meet your specific needs and wants. This also means that you can gradually increase the draw weight and speed as you improve your skill and pullback strength. The lowest setting may be too difficult for youths, so it’s not suggested to purchase this recurve bow for younger children. Additionally, this bow is only designed for right-handed people, which means that you’ll be using your nondominant hand to hold the bow and your dominant hand would be used to draw back the string and arrow. This might not also be suitable for individuals who have a height of more than six feet and less than five feet. That is because the total length of the bow is 58 inches, so it might be too short or long for them, respectively. Nonetheless, you can use this bow for hunting, recreational sports, or backyard target practices. Likewise, amateur and professional archers would enjoy using this bow. Definitely, the Huntingdoor Laminated Takedown Recurve Bow is not the right fit for everyone, and even if it is, some of you might still find it necessary to consider another option. Thus, as an alternative, we have found the Old World Yeoman Recurve Bow. 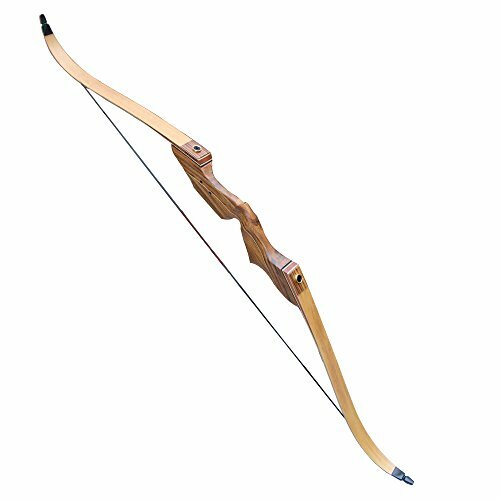 This bow has a similar wooden design and is also crafted with high-quality materials. It also has black fiberglass limbs and maple core. However, the riser does not come in any unique or eye-catching color. The good thing though is that this recurve bow makes traditional style archery much easier. It is available in two sizes or lengths namely 54 inches and 62 inches. This ensures that you can choose the right one according to your height. Additionally, the drawback weight ranges from 15 to 55 pounds, which is perfect for beginners and professionals, and you’ll be able to change the bow as your strength grows. The Old World Yeoman Recurve Bow comes with all the accessories you would need for both hunting and recreational sports. Upon purchase, you also get a lifetime warranty from the manufacturer.